Last Thursday both of our brides, had receptions starting around the same time. 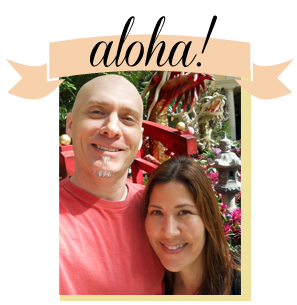 Luckily the weddings were in Waikiki (with no parades ;-) and at venues close to one another. Since Lauren had booked us first, we gave her preference on delivery time and Amy's would have been delivered slightly after the start of her reception. Not ideal but manageable. When I asked Lauren if she would mind allowing us to bring her cake a little later so Amy could have her cake by the start of her reception, she graciously said "yes". As a result of the time change, Amy's cake arrived before her reception started and we arrived to Lauren's wedding and set up her cupcake tiers shortly before her bridesmaids in their lovely green dresses and pink heels started down the aisle. As we were leaving, we caught a glimpse of Lauren, who looked absolutely gorgeous! 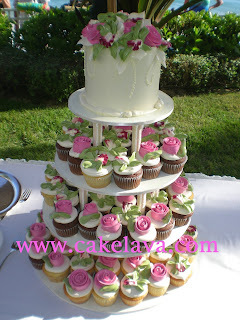 Her wedding cupcakes reflected her green cymbidiums and pink roses as well as the bridesmaids attire. All perfectly coordinated, and thanks to Lauren, a little more perfect for two brides rather than one. Ladybugs are Lucky and we're Lucky too! cakelava on Style Me Pretty's blog today!